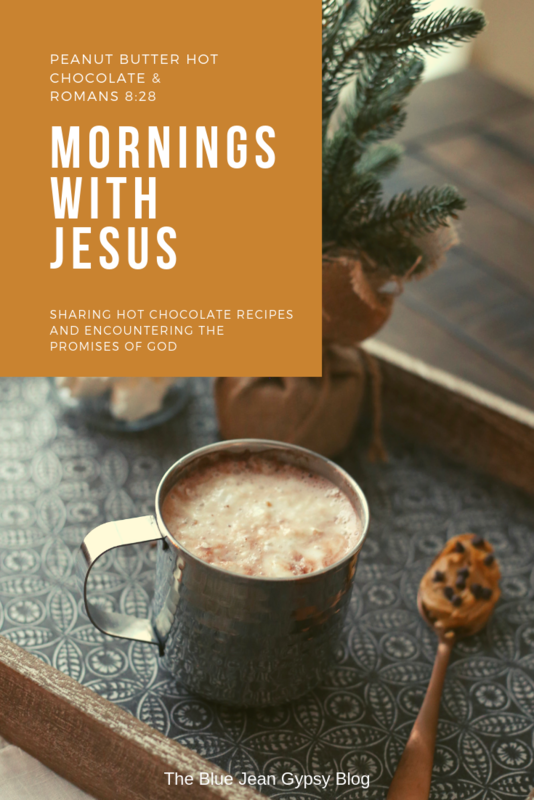 This is the last "Mornings With Jesus" for the season (but more recipes return in fall!). 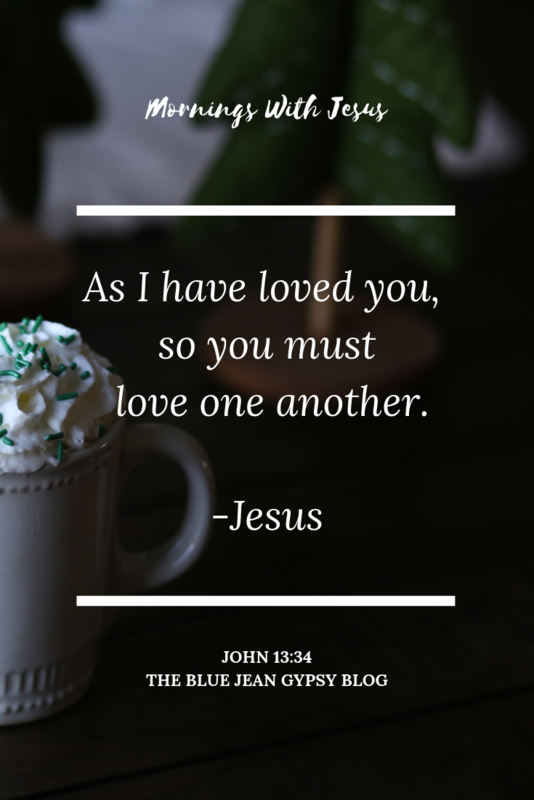 Normally, I share a promise from the New Testament along with a hot chocolate recipe, however, today, it was on my heart to share an important command Jesus gives us. A command to love. Love God. And love one another. Loving God will be a whole other post. But today, my heart is focused on loving your neighbor. Notice, Jesus doesn't say love those who look like you, talk like you, believe what you do, live like you do, go to your church, have the same social status, have certain backgrounds, or even have similar cultures. He simply says your neighbor. He doesn't refer to a certain race, ethnicity, gender, religion, or social status. He doesn't refer to those with few mistakes or many. No, Jesus just says "your neighbor". The definition of a neighbor is a person living near or next to you. A person that is next to another. Essentially, a person around us, in our midst. Physically, and in today's world, I believe that means virtually as well. I wonder how well we are doing that? This verse has been on my heart greatly as it breaks for all the violence, hate, anger, and unkindness I see on the news and even in my own community. It breaks for all the negative, demeaning, and hurtful comments that abound on social media as well. So not only do I ask, how are "we" doing with loving our neighbors well, but how am "I" doing this? I encourage you to ask yourself the same. 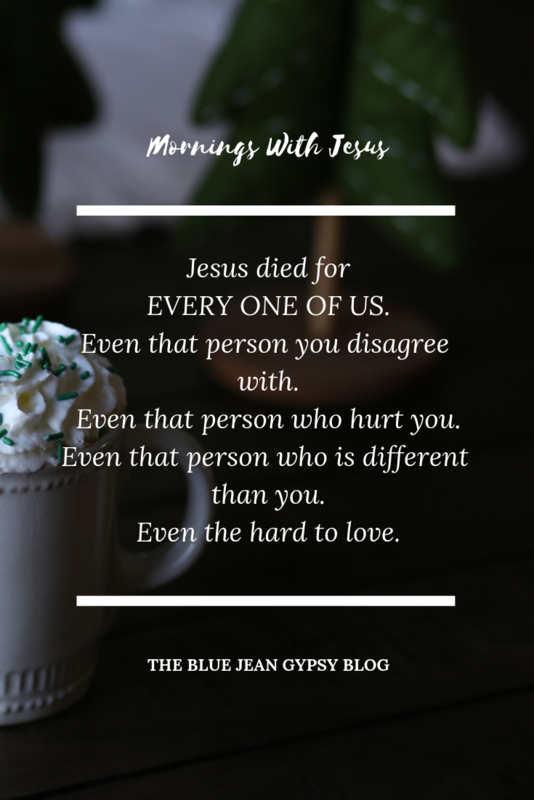 Jesus came for everyone of us. EVERY ONE OF US. Even that person you disagree with. Even that person who hurt you. Even that person who is different than you. Even the hard to love. We are called to love. Love in the image of God. Love those who around you. We can spread love by talking about it, yes. But the best way to spread love is in action. To demonstrate our love for God is to actually put that love into action. The action of loving His people. The action of loving one another. The action of loving our neighbor. Even the unlovable one. So I challenge you today. And tomorrow. And the next day and the next. Do something kind for someone who is different than you. Go out of your way to say "hi" or speak to someone that you have seen before but never spoken to. Introduce yourself to those who are sitting alone. Speak words that are not laced with anger or unkindness. Help someone who may need a meal, or a driveway shoveled. Be a part of a conversation that starts change rather than one that builds more walls. Have coffee with old friends. Listen. Stretch your comfort zone to love your neighbors. Our neighbors are all around us. Let's love them well. By doing so, it is one way of loving God. By doing so, when asked how well we are loving our neighbor, we can say, "better than yesterday". "And so we know and rely on the love God has for us. God is love. Whoever lives in love lives in God, and God in them." 1. Mix your favorite chocolate mix with your cup of milk. 2. Warm on the stove top or in the microwave. 3. Add the chocolate chips and Irish Cream creamer. Mix in until chocolate chips are completely melted. Warm a little more if needed. Sometimes life throws us curve balls. There are mountains looming in front of us we never saw coming and floods that overcome us without warning. Life is hard. But there is hope and there is purpose. 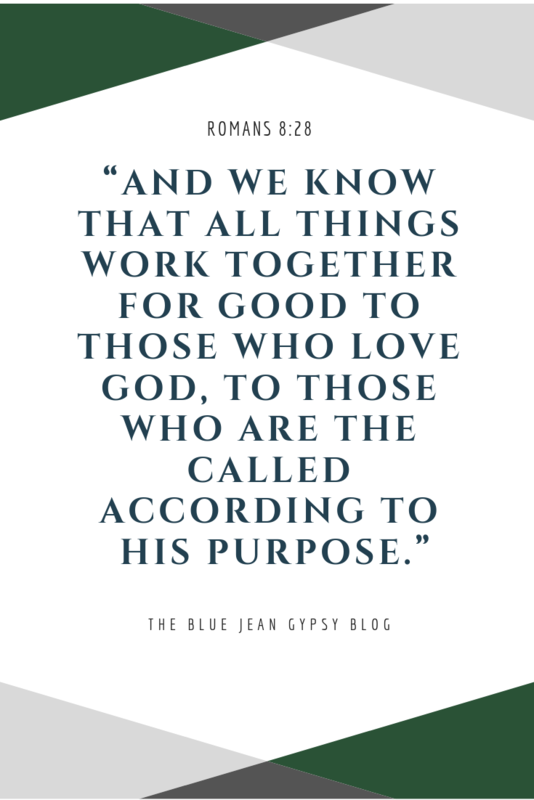 “And we know that all things work together for good to those who love God, to those who are the called according to His purpose." Often, we can't see how those things will together for good, not even with our wildest imaginations. That highest mountain? Perhaps it is not about the mountain itself, but the journey. That flood? Sometimes it may be less about our story and more about someone else's. If we look back, we can see that God has grown us or blessed us along many of the journeys we have encountered in unexpected ways. Some lessons we may not have been willing to embrace. We may have been stubborn to learn them. Others, our hearts may have been teachable and our eyes open to the abundance of good things we have seen even in the storm. But in some floods, the truth is: we may never see how God is working things out for good this side of glory. That doesn't mean He is not working behind the scenes. It does not mean His not walking beside us. It does not mean He is not using it for a purpose. Take heart in this promise. It does not say some things work together for good to those who love God. It says ALL things work together for good to those who love God. Whatever you are going through today it CAN and WILL be used for good! God will use it all for His purpose whether we choose to be a part of the process or not, but when we choose to be a part of it, there is no doubt we will be changed. So offer your mountain, your flood, your storm to the Lord, trusting and knowing that it will be used it amazing ways! 1.Make 1 cup of hot chocolate the way you like it (I suggest making it with milk vs water). 2. Add heavy cream, peanut butter and chocolate chips (if desiring a more chocolate flavor). Stir. 3. Add whip cream on top if desired and gently stir in. 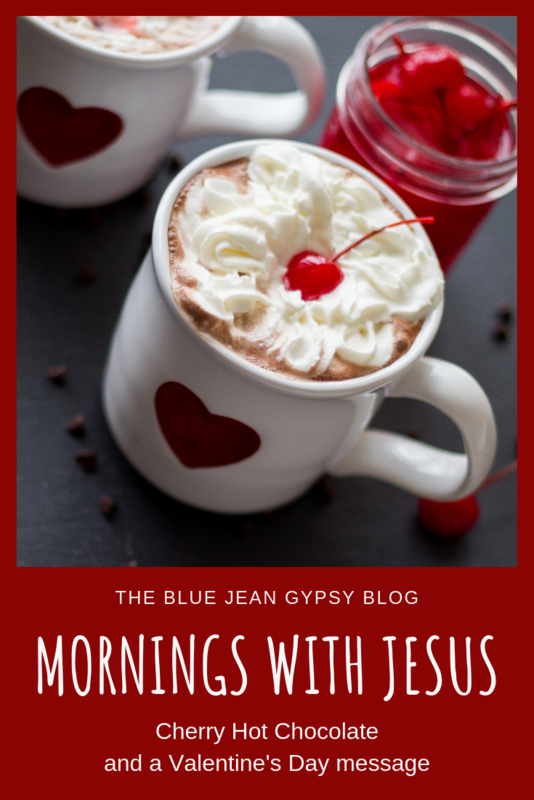 One of my favorite summer treats is a cherry chocolate milkshake, so it is no big surprise that this Cherry Hot Chocolate recipe is a favorite of mine as well! 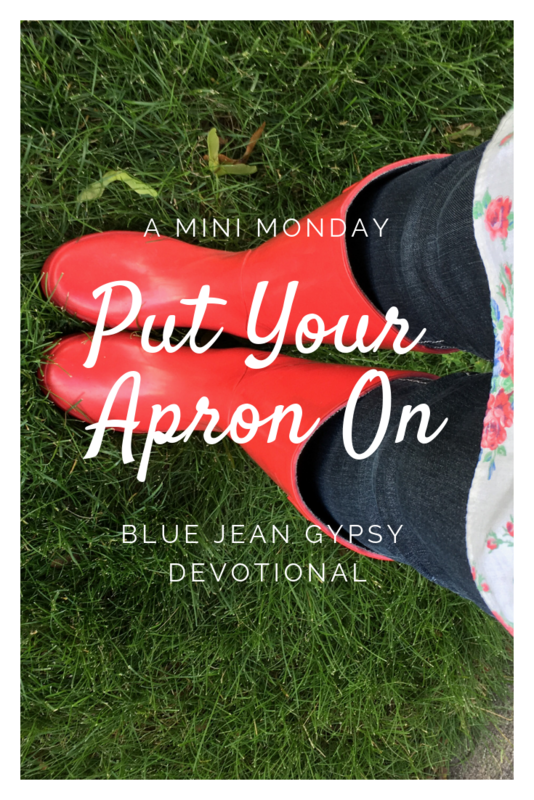 Read on for the recipe and for a little reminder, from me to you, that YOU ARE LOVED. 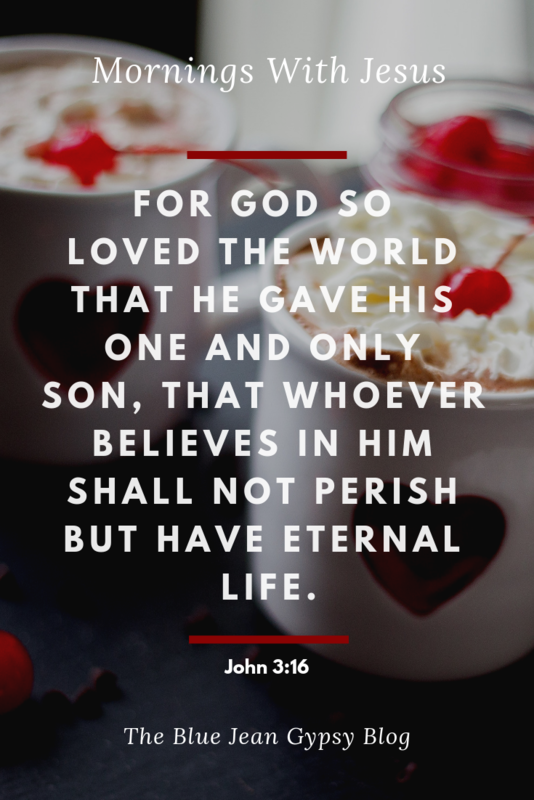 Take some time today to spend with the greatest valentine you will ever have, the One who's sweet whispers of love to you will endure and never fade. 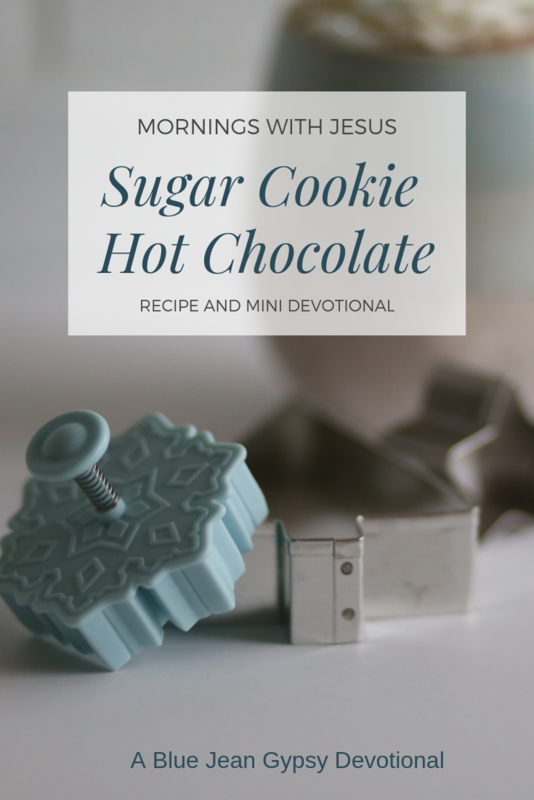 Keep scrolling for the hot chocolate recipe, make a cup, grab a blanket, and enjoy some quiet time! This one is so simple! 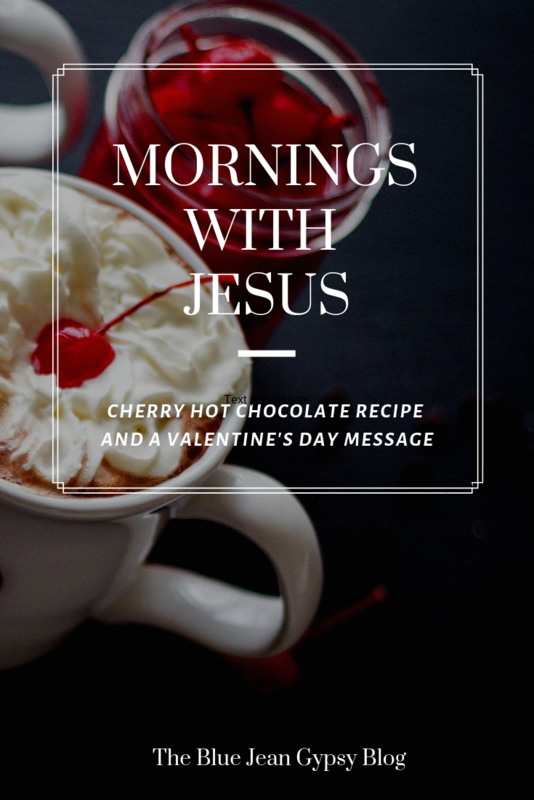 Make your cup of hot chocolate the way you like it, add 2 tbsp of maraschino cherry juice (1 tsp if you like a little less cherry flavor) and mix well. Add whip cream and top with a cherry or two. Then enjoy! 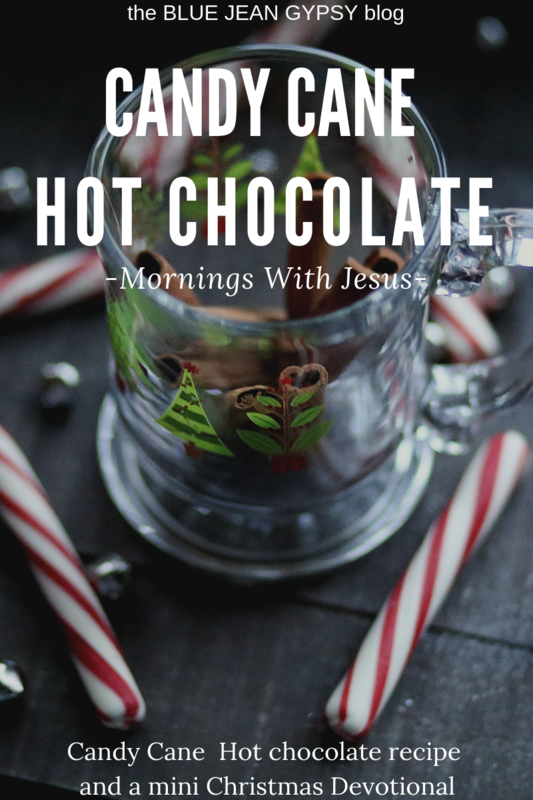 For more hot chocolate recipes and faith inspiration, check out more "Mornings With Jesus" or follow my pinterest board "Hot Chocolate and Jesus". My grandmother often gathered her friends over for a meal and for fellowship. Over the years, I heard many stories of their conversations and the time they spent together. Shortly before she passed away, I was invited to come sit at this table, too. She had her china set out and her fancy, green antique chairs were being used. 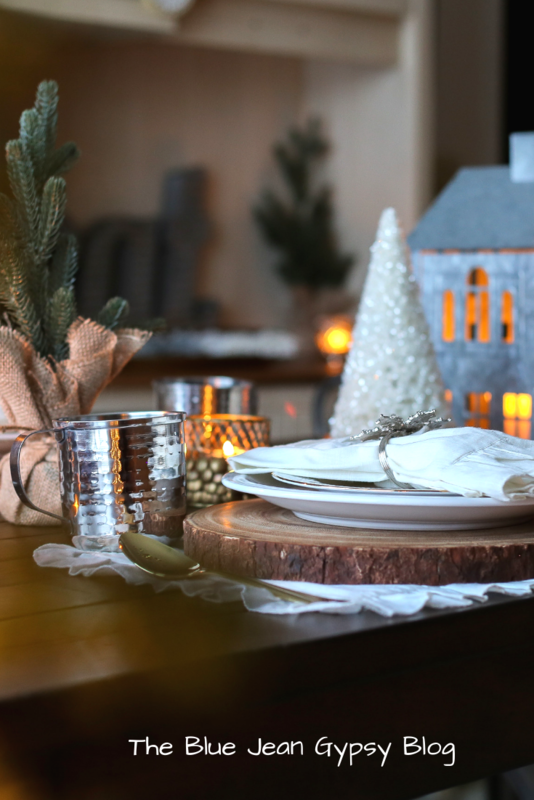 It was obvious she put time into setting that table, but what lingers most in my heart is the warmth I felt gathered there. The overlapping of generations that spoke to me. No matter our age-90 or 30-we were all just women. Women who need to talk, to listen, to share our stories and struggles, to know we are not alone. ​We all need a place where we can be vulnerable, where someone understands. A place to have both the tough conversations and to laugh those belly laughs. ​We are called to it. And we are called to share the table with Jesus as well. 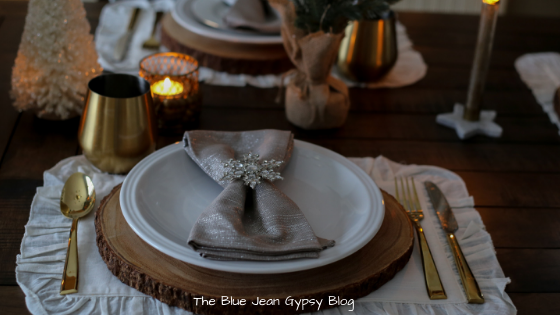 As I share various tablescapes each month, it is my hope that you not only remember that Jesus has a place at His table for you, but there is a place at the table right here with me too! If you have a prayer need, or a subject to tackle-I'd love to know! May this place be a warm, inviting one. May this be a place to encourage you, not only in faith, but to reach out in hospitality to those around you. To have a place waiting for family, friends, and strangers alike. 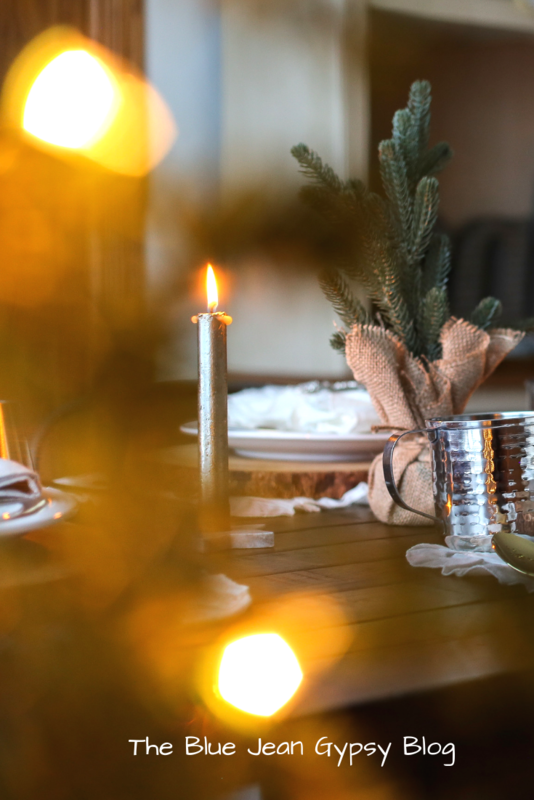 To make a place at the table to share love, friendship, and the light of Jesus with those around you. Especially those who might not have a place at any other table than the one you and Jesus invite them too! Come take a seat here at this table month after month! let others know they are loved and they are welcome. 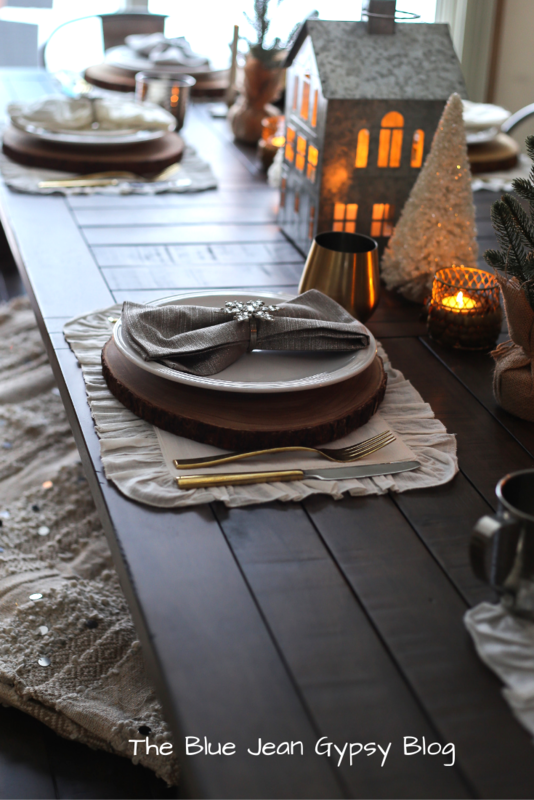 Check out below, a winter tablescape that brings a little warmth into this blustery season! This winter, at least here in Wisconsin, has been blistery, snowy, icy, freezing cold, and even rainy. And while every winter is a little different here, one thing always can be counted on-some dark, dreary days. Those days can be hard for me. Maybe they are for you too? I have found that there are two things that help me during this time. 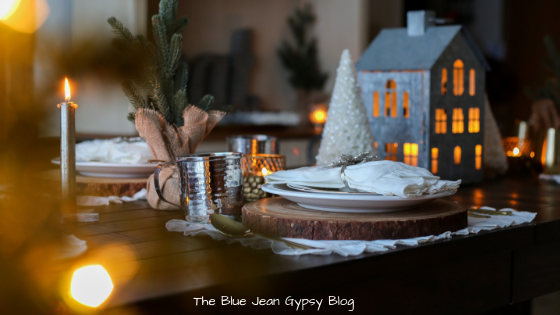 Gathering with friends and creating some warm inviting decor with candles and a few things that reflect the wintery season. 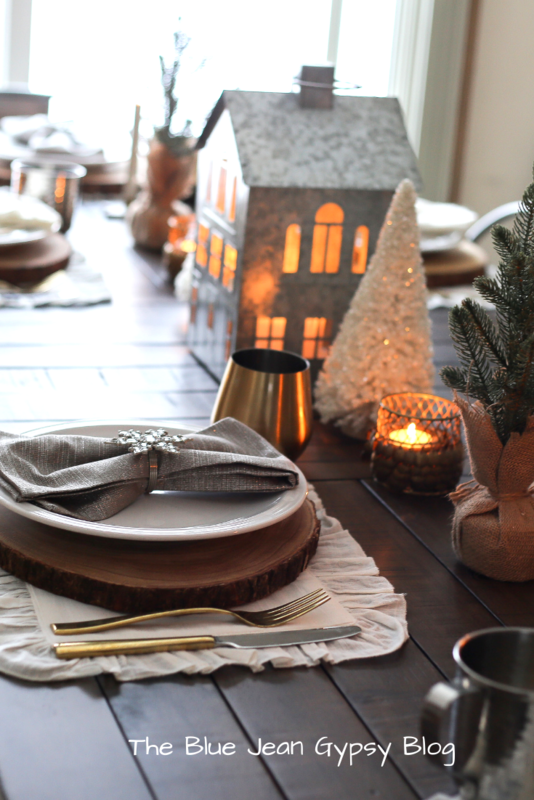 So keep scrolling and I will share how I set up this winter tablescape! These wood chargers are so versatile. My daughter actually got them for me for my birthday this year. She knew I had been wanting them for years. I would probably use them with each tablescape if I didn't need some variety once and awhile. 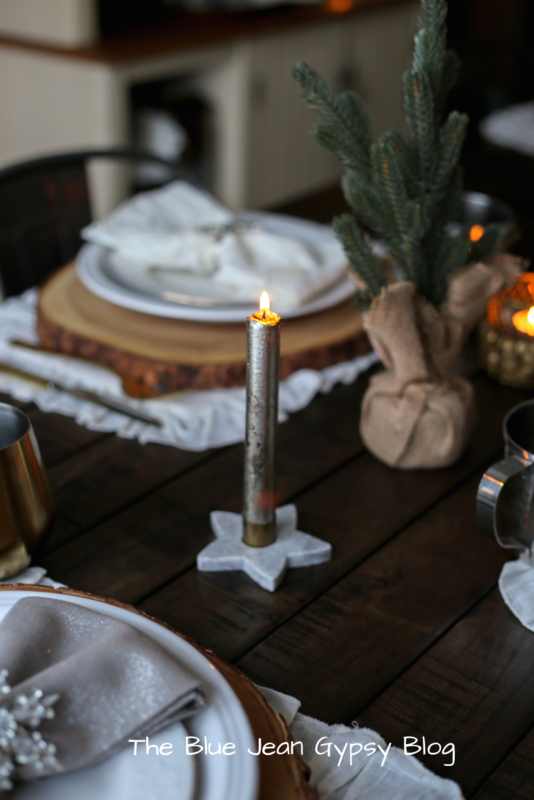 They bring a warm, earthy element to just about every tablescape! And just in case you are wondering...they came from World Market. I like to switch things up a little sometimes. 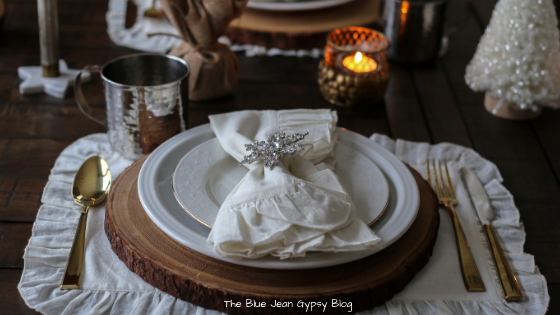 For this tablescape I decided to use to different style/color napkins. 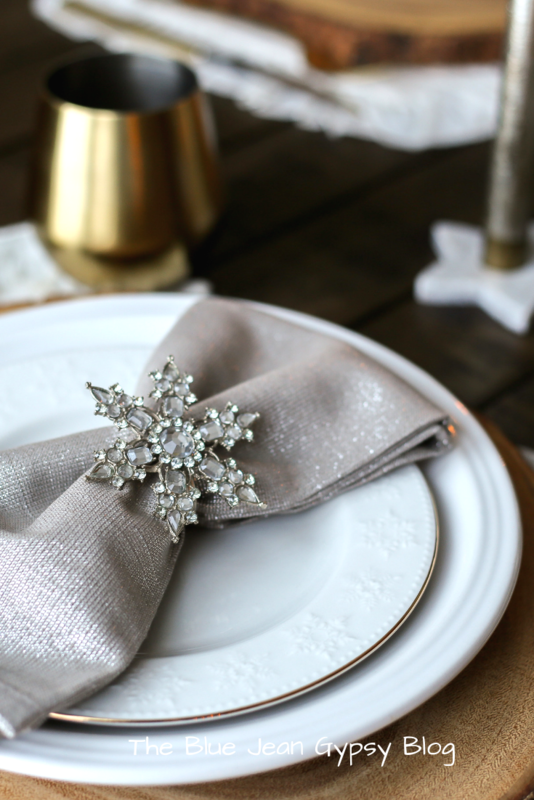 I orginally was just going to use the silver, but something about mixing it up, when I placed both the white and the silver napkins on the table, spoke to me. 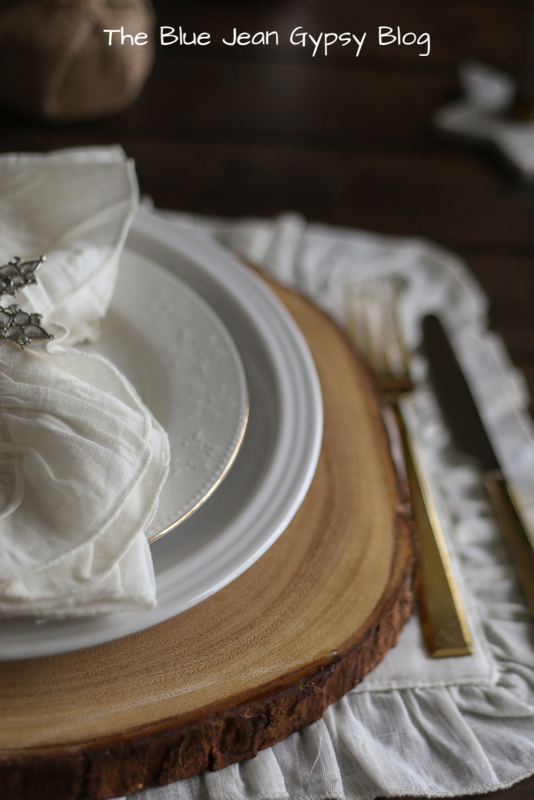 This is also a great idea if you are having a larger group of people over and don't have enough matching napkins- use two different styles to add some dimension and no one will ever know why! The silver napkins I got on clearance last Christmas at Target (do I have any Target lovers here?) and the white napkins I got on clearance (for $1.50!) at Pier 1 (Pier 1 lovers can raise your hands with me here). The bigger white plates are just my day to day dinner plates, but the smaller white plates with the gold rim and raised snowflakes? I got those from Goodwill. I had been eyeing them up, and we they went on clearance for $.75, well, I couldn't pass that up! They fit perfectly into this tablescape. 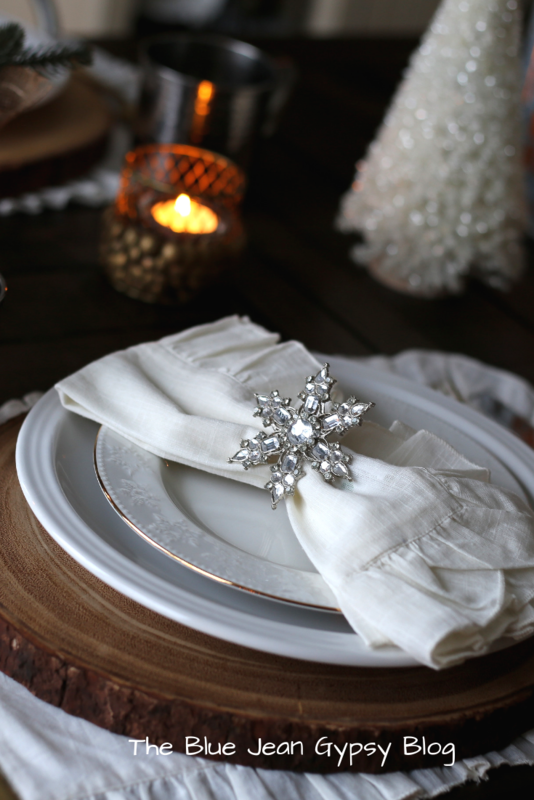 These snowflake napkin rings are really one of my favorite winter table decor. I have had them for a few years (another treasure from Pier 1) and the way they capture the light is just stunning! I like to mix up drinkware as well! 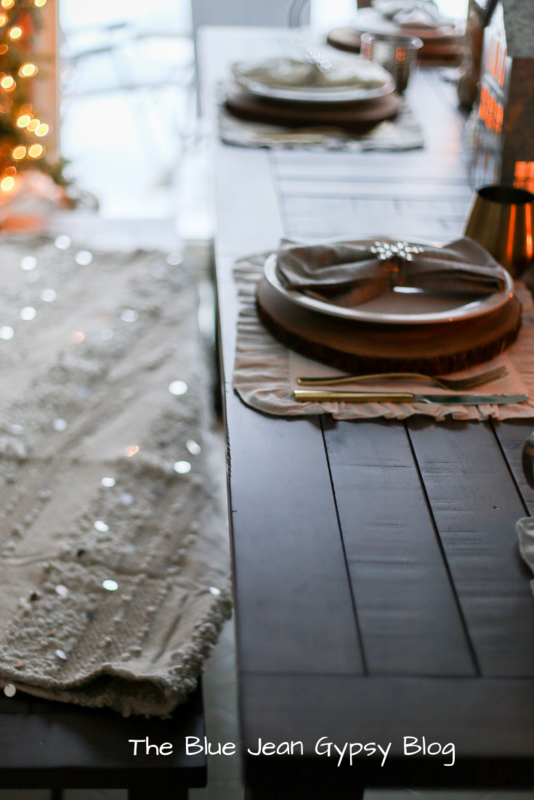 For this tablescape, because I wanted to highlight both silver and gold, I used silver and gold drinkware. I like to use what I have to make totally new settings. Both the gold and sliver drinkware were ones I had for several years (from Target). 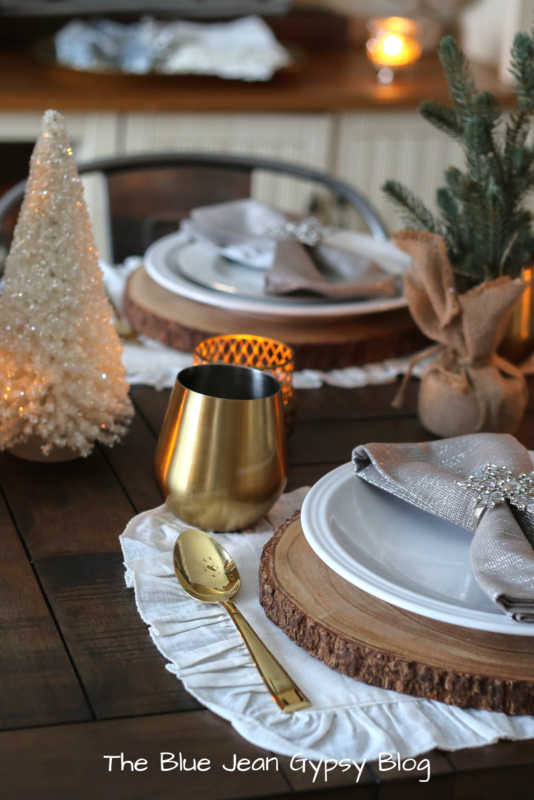 I used gold silverware to add a little more gold to the tablescape. 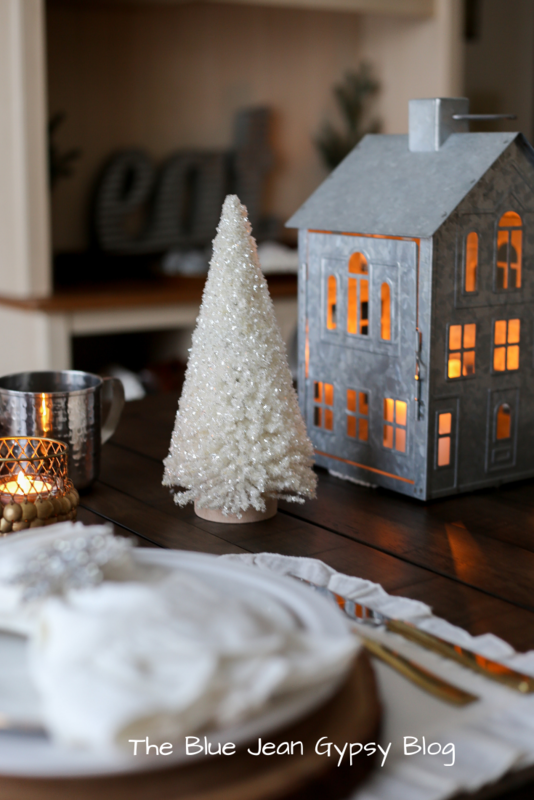 When Christmas is over, I like to use some of the more neutral decor as my winter decor. Like these white trees (from world market) and these green trees with the burlap. And yes, I keep a few smaller trees (with no ornaments) lit with white lights through the month of February. This helps me on those dreary days! 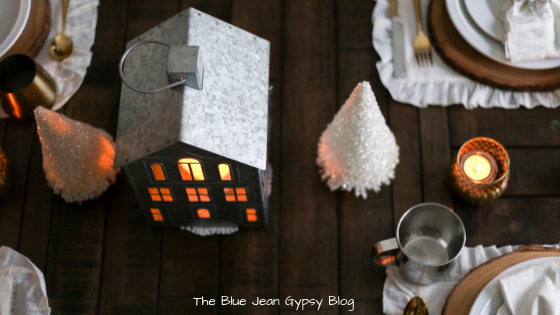 This house lantern just seemed to fit as the center of this tablescape. I grabbed it from somewhere else in the house, but it has found a new home here on the table. Found it at Walmart! Last but not least is the blanket. It adds warmth to the bench and I feel is so inviting, not to mention it matched perfectly with the table decor. I grabbed it out of my blanket bin. I rarely buy anything at full price, and this blanket is another World Market product that I waited for over a year to go on sale. It finally did! 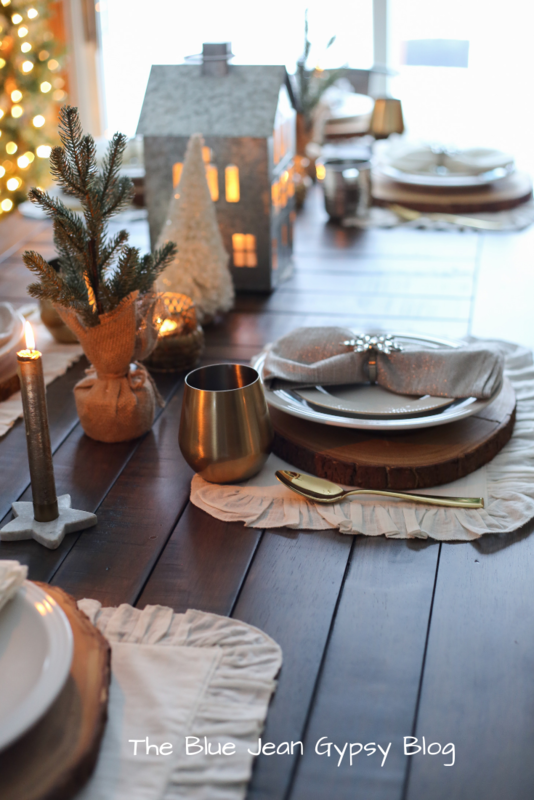 Whether it is an inviting tablescape, a delicious meal, or just a cup of coffee, I hope, this winter (and always), you stay warm, gather often, be the light of Christ, and love others well! 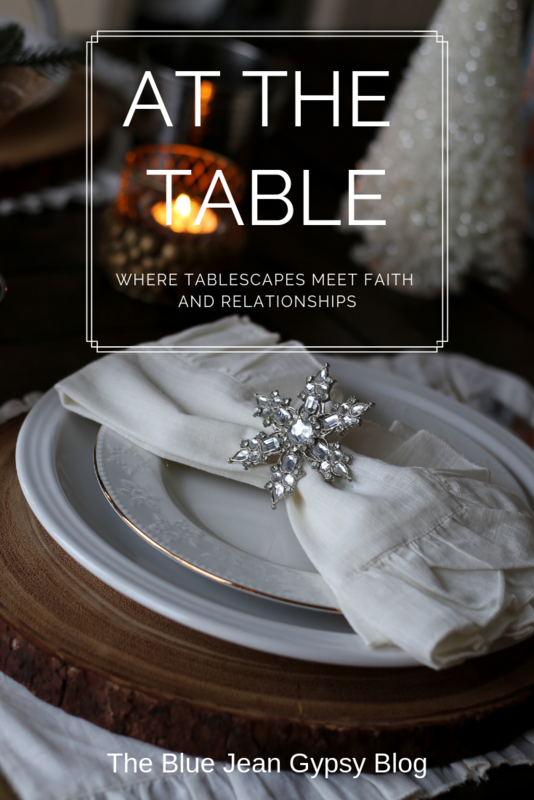 Join me again "At The Table", for more tablescapes, and encouragement in faith and building relationships! 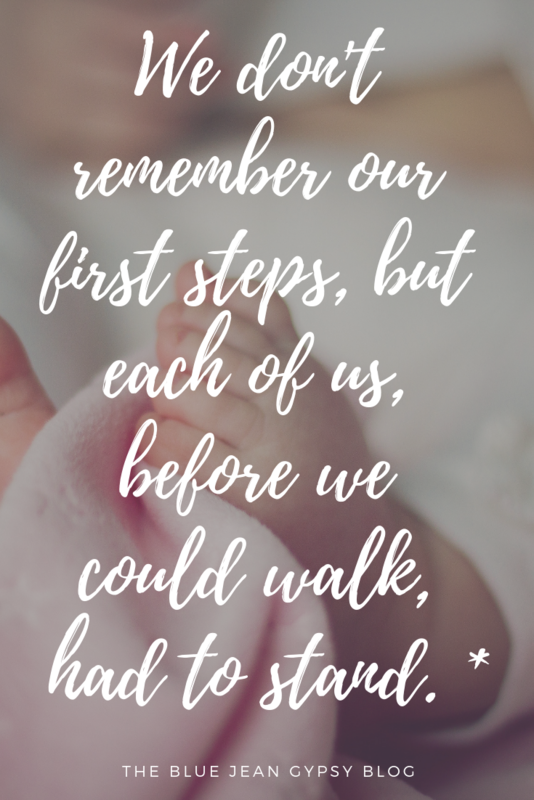 We don't remember our first steps. Those first wobbly attempts in early childhood that we made to pursue a freedom we couldn't totally understand yet. Paul and Barnabas went to a city named Lystra. There they preached the Gospel. A man who had been lame all his life (since birth) listened to the preaching. "He listened to Paul as he was speaking. 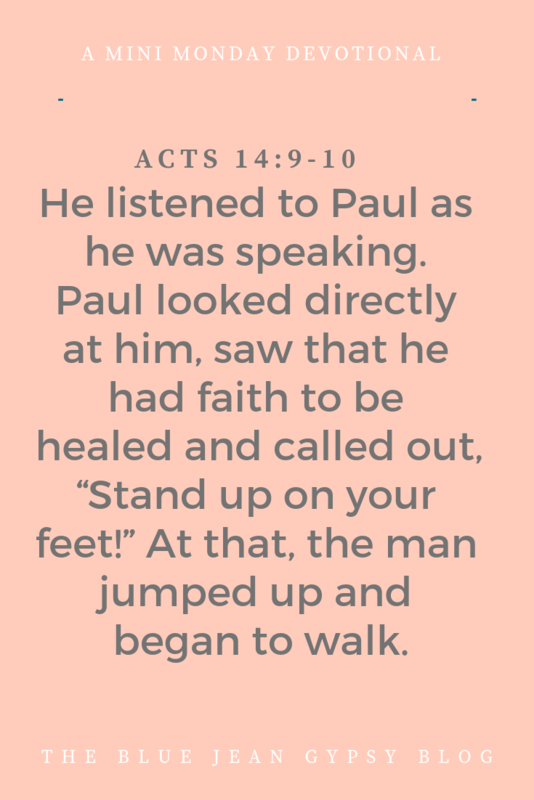 Paul looked directly at him, saw that he had faith to be healed and called out, “Stand up on your feet!” At that, the man jumped up and began to walk." There are times we don't feel qualified, times we fear failing, times we feel paralyzed, times we are unsure of where the next step is. And let's be honest, maybe we have experienced a time where we couldn't even put one foot in front of the other. A difficulty in front of us. A calling we don't feel equipped for. During these times, God is not asking us to walk alone! He is not asking us to walk on newly healed legs of our own strength or ability! He is asking us to STAND UP. There is nothing the man did except have faith. It was that faith that initiated the healing. 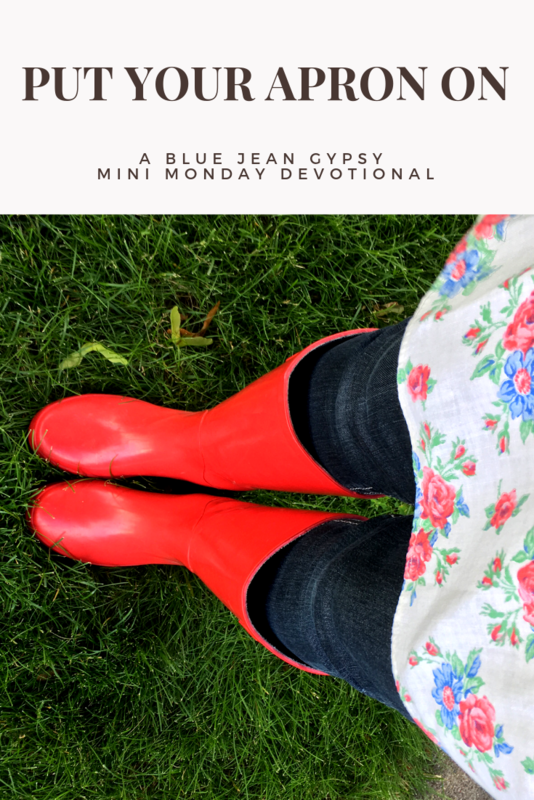 It is by our faith, and God working through us, that he equips us for tasks ahead, strengthens our wobbly legs in the midst of difficulty, and that He begins to peel back the layers of brokenness. Note above, the man didn't just stand up- he JUMPED up! This action of jumping shows exuberance and even expectation. 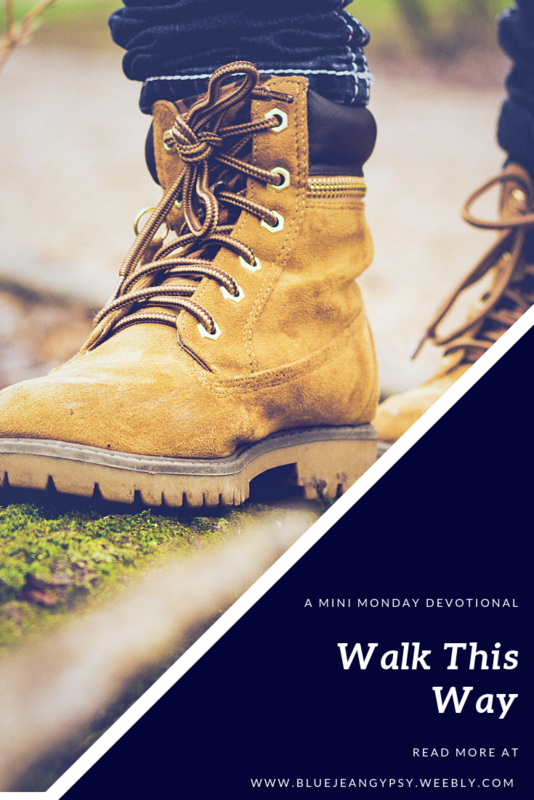 When God calls us to move in faith, do we slowly get up, checking to make sure of the stability of our legs before walking? Or do we, like this lame man, take a leap...a jump...in faith...with the assurance that when we leap up, God will place our feet on the ground. That He will strengthen, and guide, and equip us? When God calls us to walk in faith, let's not only stand up but jump! Let us trust Him, with great assurance, to move our feet, to walk, when we thought we could not! 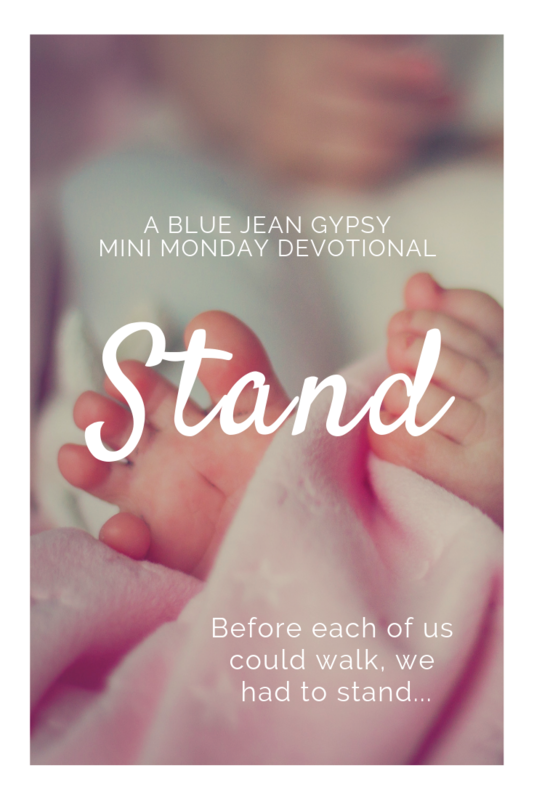 I'd love to hear how you have been standing up-or jumping up-in faith! As always, I welcome any prayer requests that you may have. Hope your are staying warm in this cold burst of weather! I have been curling up with a lot of blankets and hot chocolate the last week. How about you? 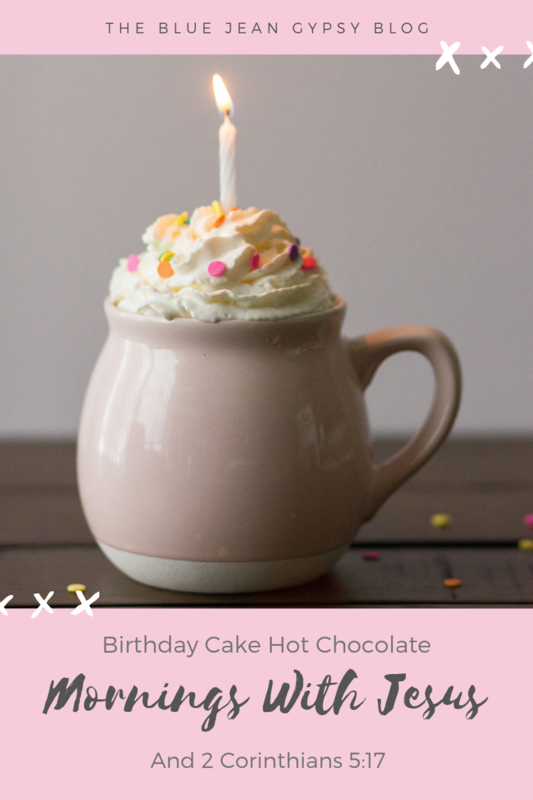 This week I wanted to share a fun hot chocolate recipe with you, Birthday Cake! A new year is here and 2018 is gone. 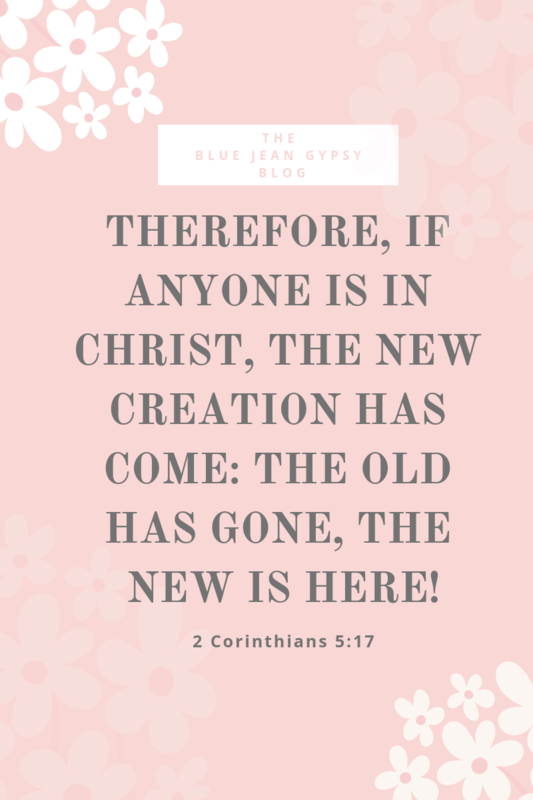 As believers in Christ, our old selves are gone as well and we are created new in Christ. With new hearts. With new hearts...and new perspectives. Paul wrote this verse to the Corinthians, who while they were believers, were stuck in a place of continuing to judge and evaluate others on external appearance. They were influenced by the world view around them. A world view that judged outward, physical presence. 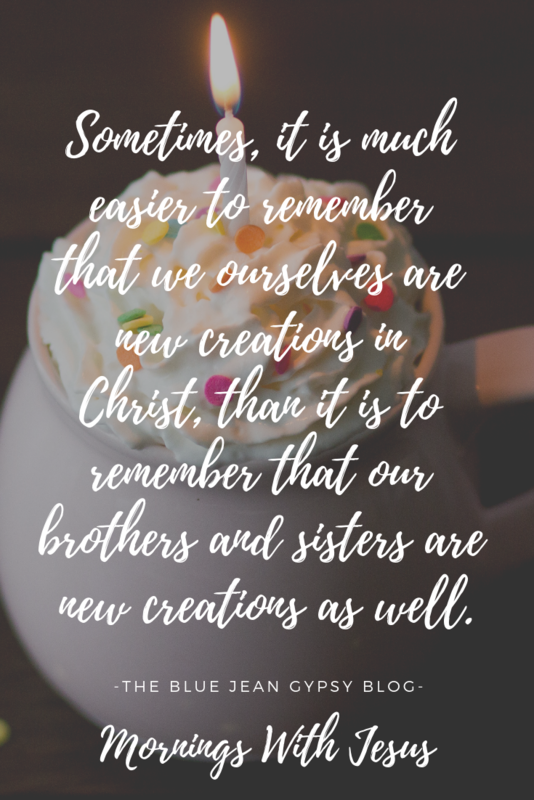 Sometimes, it is much easier to remember that we ourselves are new creations in Christ, than it is to remember that our brothers and sisters are new creations as well. It can be difficult at times to remember to see others through spiritual eyes. To assess spiritual nature rather than physical nature. But as new creations, that is what we are called to do. Our culture today, with it's large emphasis on physical appearance, can influence us the same way the culture in Corinth influenced the Corinthians. Let us remember to see others in light of the new creation and new nature they have been given in Christ. The old is gone, the new is here! Let's make 2019 a year we look to see the newly created hearts in others. Let's make a lifetime of looking inward rather than outward! Place milk, white chocolate, vanilla and butter vanilla in your favorite mug. Mix and then warm on stovetop or in the microwave. Add whip cream, sprinkles, top with a candle, and serve to that special birthday person! 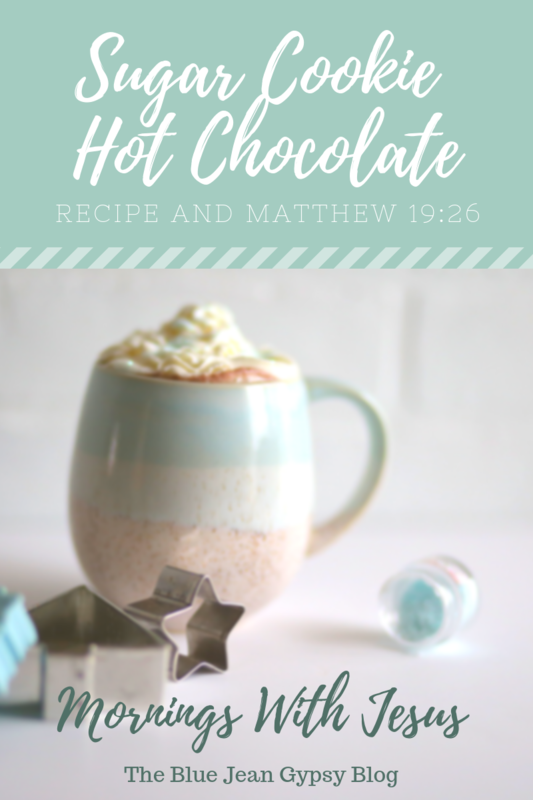 If you have been made new in Christ, believing in Him and no longer living your life for yourself but rather living for Jesus, go ahead and serve this hot chocolate recipe to yourself as well- and remember the new creation you are! 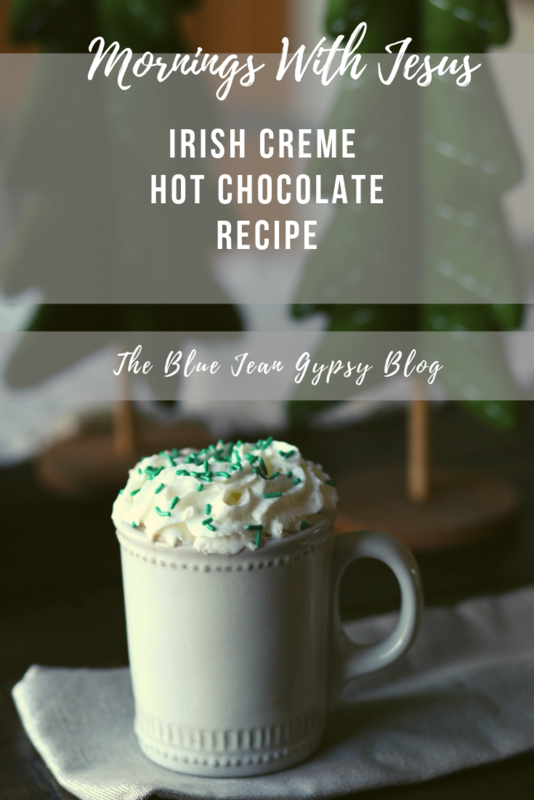 Looking for a delicious hot chocolate recipe to serve on Christmas Eve to guests or to make as you curl up and watch a movie? 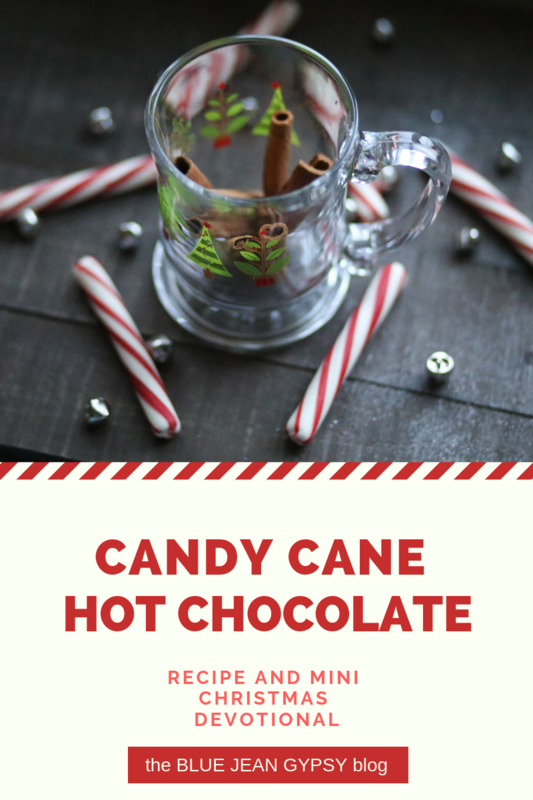 This candy cane hot chocolate recipe is my go-to for our hot chocolate Christmas traditions! I hope it makes it into yours as well! Christmas is so much more than trees and lights and presents and food. It is more than gathering with family and friends. It is a celebration of the birth of Jesus, but it is also a celebration of promise. A promise of hope, peace, redemption, and life. It is a promise that God is with us. That He loves us. A promise that though life has trials and hardships, God is faithful and good. For unto us a child was born and through Him hope was gifted to those who believe. Let us celebrate this hope. This redemption. This peace. This life eternal. Bring whatever you have -whether your faith be little or big- to the manger. And in return, receive a gift like no other. This Christmas I wish you joy where there is sadness. Peace where there is anxiety. Expectation where there is trepidation. Hope where there is defeat. And rest where there is weariness. May your day be filled with not only love of family and/or friends, but filled with the promises that Jesus brings. 1. Combine all the ingredients (except the tablespoon of crushed candy canes) and heat either on the stove top or in the microwave until the crushed candy canes are melted. ​2. Pour into your favorite holiday mug. 3. Top with whip cream and sprinkle left over crushed candy canes on top (if desired). 4. Enjoy and have a merry and blessed Christmas! Who doesn't love sugar cookies? And who doesn't want a little reminder that the impossible is possible? Something jumps out to me in the first four words of the verse, "Jesus looked at them". He didn't give this promise looking down the road ahead of them, or looking down at his food while they ate. No. He looked AT THEM and gave the promise. This was a profound promise and an answer to the question in the previous verse "who then can be saved?" I imagine His penetrating gaze looking into their astonished ones-and telling them that with God all things are possible. How much more weight does it carry when someone looks us directly in the eyes and tells us something; a truth. How much more importance does it show? Reflect on this as your read on. Jesus may have been responding to the question of "who can be saved" after speaking about the danger of wealth and the difficulty those dangers cause for the rich to enter the Kingdom of heaven, but He gave us so much more in that response. He reminded us that salvation doesn't rest in our good works, our status, or anything that we are or will do. Our salvation rests in Jesus. And joy can be restored. Mix milk and creamer on stove top or microwave. Mix well. Add whip cream and sprinkles if desired. Enjoy! *For a twist, make your hot chocolate as usual and just add 1/3 cup of the Sugar Cookie Creamer to it for a chocolate sugar cookie flavor! In Acts 19, we are told that the Lord was doing great things through Paul. Particularly that God gave Paul the power to do extraordinary or unusual miracles ( Acts 19:11). Yes! When the handkerchiefs or aprons that had touched Paul's skin were placed on sick people, they were healed (See Acts 19:12). So why aprons and handkerchiefs? Acts doesn't tell us anymore than this, but if we dig a little deeper, I think the message is quite clear. What were handkerchiefs used for back in Paul's time? To wipe the sweat off your brow. Most likely when a person is working hard. And aprons? What are they used for? They are worn to do work or acts of service. They both are symbols of service. As Paul served and did what God called him to do, these aprons and handkerchiefs were an extension of Paul's work, service and ministry. What healing can God do through our own service? Our aprons and handkerchiefs may not perform miracles such as this (and we may not even use any in our work) but that DOESN'T mean that when we serve, God cannot touch others. Let the apron, the handkerchief be a symbol of the serving WE can do. Let's put the apron on, tie the strings, step forward and say "here am I". Then wipe the sweat off our brows, serve with full hearts and watch what God CAN and WILL do! How are you currently serving others? I would love to hear how God has worked through your personal acts of service! I would guess that most of us have played 'follow the leader' at some point and time in our childhood. We chose a leader and marched around;following the leader wherever he or she went. Perhaps even imitating their actions. We may feel that this is just a game from our childhood. But to an extent, we still play the game don't we? It may look a little different, but we still 'follow' a lot of things. We follow people on social media. We follow who and what the world says we should be. In the first few chapters of Mark, Jesus says to Peter, Andrew, John, James, and Matthew-"Follow me." He wasn't asking them to hit a 'like' or a 'follow' button. He wasn't asking them to just listen to stories He would tell or the rumors that would spread about Him. He was asking "follow ME". He was asking them to step away from everything else and follow HIM. The Greek word used in Mark 1:17 for 'follow' is 'akoloutheo'. What it literally means is to walk the same road or to accompany. It is an active word. A word that calls for a choice to be made. It calls for a choice to go down a road that is a mission path, that may be hard sometimes, that leaves your old self behind. But it is also a road that is good. One that brings comfort and peace, new life, and wisdom. It touches the lives of others, and abides with Christ. So will you follow Him and not just click the like button? Will you choose to walk the road with Jesus? To accompany Him as He accompanies you? When Jesus calls for you to follow Him...will you walk His way? 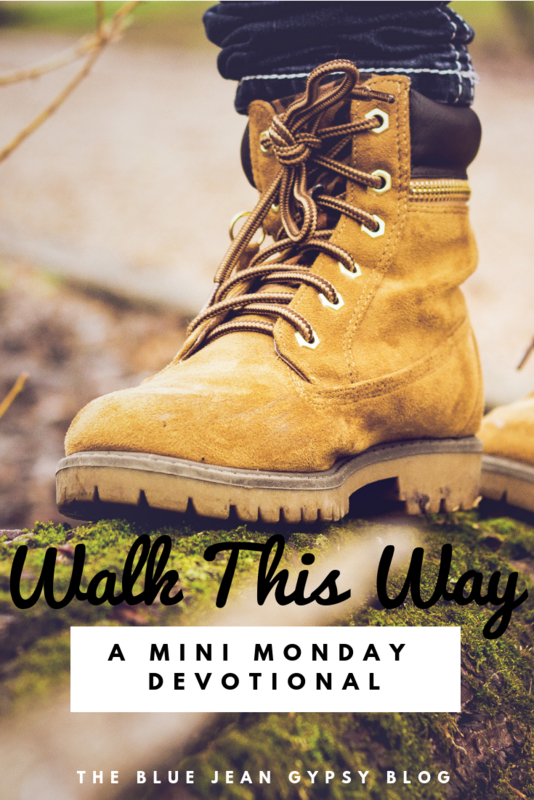 For other faith inspiration, join me on pinterest!